A wise headmaster once said that "one can never have enough socks." Well, the same goes for Harry Potter books - there's no such thing as too many copies! This is good news, because Bloomsbury Publishing just debuted eight new covers for Harry Potter and the Chamber of Secrets, and they're perfect for showing off your Hogwarts House pride. There's a new hardcover and a paperback edition for each of the four Hogwarts Houses: Ravenclaw, Gryffindor, Slytherin, and Hufflepuff. 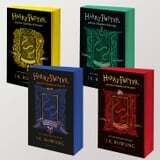 Each of the new books displays its respective house coloring, and the hardback editions also showcase the house crest and a list of admirable house traits.